a. Wet or Icy Rock. These impediments can make an otherwise easy route almost impassable. b| Rocks overgrown with moss, lichen, or grass. These areas can be very treacherous when wet or dry. 9 Tufts of grass and small bushes growing from loosely packed soil. These normally appear firm, but can give way suddenly when they are pulled or stepped on. d Gullies that are subject to rock fall. If you have to use a gully that has evidence of rock fall in it, then try to stay to the sides. e. The most common danger is the overestimation of your own ability. TRANSITION: Once at a cliff face, it is imperative that we keep in mind our responsibilities in order to maintain organization. Pre-select probable route. b Ensure he has the proper equipment to complete the route. 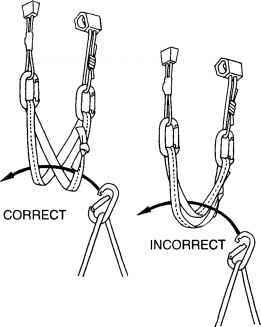 SI Ensure that the climber and the #2 are tied into their respective ends of the rope. 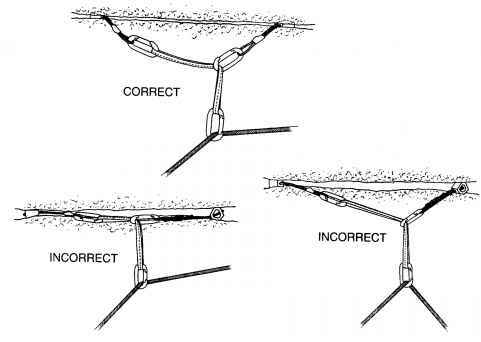 d. Ensure that the #2 has selected the proper anchors for the belay anchor system. HfiTake a length of 1 inch tubular nylon webbing and tie the ends together using a water/tape knot forming a loop so it fits over your head and shoulder and runs diagonally across your chest. If tubular nylon webbing is not available, then utilize one of your runners, if the route will permit. 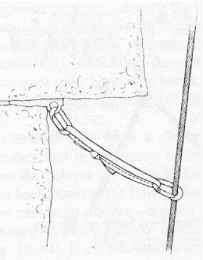 A sling rope could also be used as a gear rack. TRANSITION: Now that we have covered dangers to be avoided when selecting a route, are there any questions? As we climb, and we have all of this gear on our body, we need to know when and where to place our pro. 3 First runner rule. A good piece of protection should be placed as high as possible just before leaving the ground to prevent hitting the ground in a fall. Once that first piece of pro is at waist level, a second piece should be placed as high as possible. A third piece should be placed following the same guidelines as the second piece (this will reduce the chances of the leader bottoming out). Every 10 to 15 feet. This is done to prevent the possibility of taking a long fall. On a short route, 30 to 50 feet, protection should be placed every six to eight feet to prevent bottoming out during a fall. c. Before and after a hard move. A leader should place pro before and after a hard move (crux) because a fall is more likely. If you are not satisfied with that piece of pro, back it up with another one. 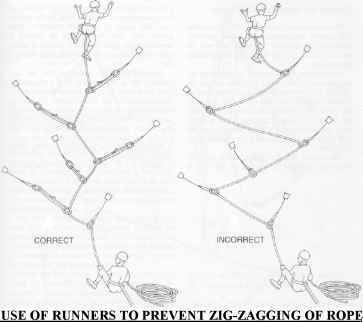 If a ledge is encountered during a climb, the first runner rule will apply again. d. When the climber feels that protection needs to be placed. When in doubt - stitch the route. e. When placing a number 1 or number 2 stopper, always backup these pieces of protection with a secondary piece as soon as possible. 5. (5 Min) PREVENTING ROPE DRAG. Rope drag causes all sorts of problems. 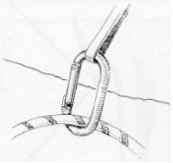 It can hold a climber back, throw him off balance, pull his pro out, and can make it hard for the leader to pull enough rope up to clip the next piece of protection. 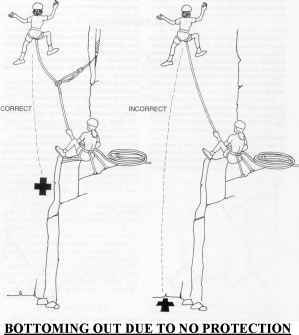 Also, rope drag can affect how well a belayer responds to a fall by reducing the ability to provide a dynamic belay. 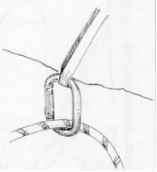 Keeping the rope in a straight line from the belayer to the climber is the best way to reduce rope drag. b. Runners / Quick draws. 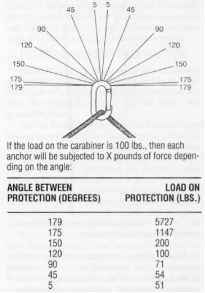 Protection should be placed so that the rope follows as straight of a line as possible. 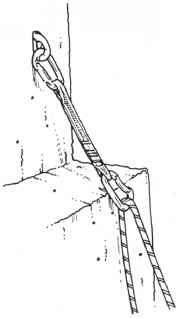 If the protection placements do not follow a straight line up the pitch, and the rope is clipped directly to these placements, it will zigzag up the cliff, causing severe rope drag. If the protection cannot be placed in a direct line, runners or quick draws can be used to extend the protection. 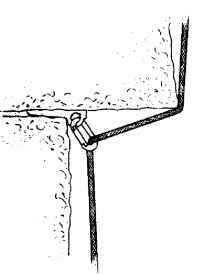 This will allow the rope to hang straight and run more freely through the protection system. If you use an extra long runner you can create another problem. 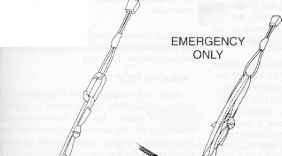 The extension may keep the rope in a straight line, but it may also add dangerous extra feet to the length of a fall. In such a case, it is sometimes better to accept some rope drag in order to get better security in case of a fall. 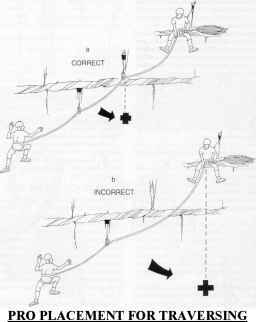 )lf the protection placements happen to be in a straight line, the rope will run straight and there will be less rope drag even if it is clipped directly to the protection. However, you must be aware that rope movement can and will jiggle a chock out of position. So a quick draw can be used to isolate the pro from rope movement. 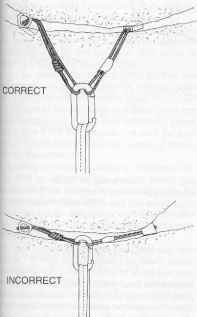 )Quick draws should always be placed on wire protection and SLCD's without pre-sewn runners that are used for running belays. 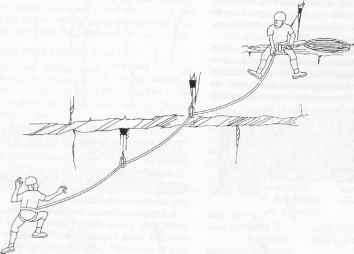 There is no requirement to place quick draws on wire runners used for a belay stance, unless you need some extension. n^Quick draws do not need to be placed on corded hexcentrics or chocks unless you need extension.